Believe it or not, tapestries, with their intricate detail and weaving, have been around for over two-thousand years. 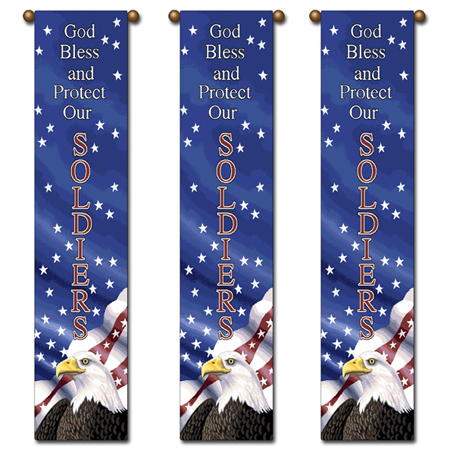 Show your support for a loved one, friend, or for this great country in with a patriotic, decorative wall tapestry. This Made in America tapestry is full-count cotton and very rugged featuring the words �God Bless and Protect Our Soldiers� with a drawing of an American Bald Eagle below the phrase woven into the artwork. Once called �nomadic murals� and used by kings as a show of authority (and to insulate their castles in the winter) their success can be traced to their beauty as well as their portability � this is truly art on a textile!